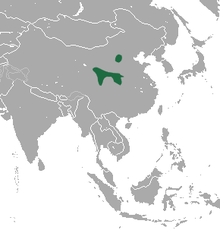 The Tsing-ling pika (Ochotona huangensis) is a species of pika endemic to the mountains in Central China. They inhabit mountainous forests and shrublands. It is a poorly known species. ↑ Smith, A.T. & Johnston, C.H. (2008). "Ochotona huangensis". IUCN Red List of Threatened Species. Version 2014.2. International Union for Conservation of Nature. Retrieved 21 September 2014. Yu, Ning; Zheng, Changlin (2012). "A revision of the huanghe pika Ochotona huangensis (Matschie, 1907)". Acta Theriologica Sinica (Article)|format= requires |url= (help) (in Chinese). 12 (3): 175–182. ISSN 1000-1050. Vakurin, Alexey A.; Korablev, Vladimir P; Xue-Long, Jiang; Grigor'eva, Tat'iana V (2012). "The chromosomes of Tsing-Ling pika, Ochotona huangensis Matschie, 1908 (Lagomorpha, Ochotonidae)". Comparative Cytogenetics. 6 (4): 347–358. doi:10.3897/CompCytogen.v6i4.3183. PMID 24260675. Retrieved 30 April 2015.